Most Americans see themselves as "middle class." But in most low-income countries, "middle class" is more likely to describe an aspiration than a sense of belonging. As a result, the economic, sociological, and political role of the "middle class" can be quite different across high-income and low-income countries. In developed economies, many people define themselves as middle class, and so the idea represents a shared sense of how most people in a society live. In emerging and developing economies, being middle class is typically more of an aspiration, representing how most people would like to live. From an economic point of view, the middle class is considered the driver of modern consumption societies. From a sociological perspective, the formation of a social class includes other factors: a specific economic position (possibly creating conflicts of interest with other social classes) and a consciousness of having similar conditions. Today in Western societies, relatively high levels of consumption of goods and services define, or are a major attribute of, the middle class. Some identify this increasing consumption as consumerism and argue that this profoundly changes traditional social relations within the middle class because people tend to be more individualistic than class-oriented, and social relations are driven by more hedonistic and individualistic patterns. In this view, both factors contribute to the erosion of the class identity in all societies. In emerging and developing economies, such consumption is still perceived more as a privilege of the upper middle class than as a unifying social force, as in Western-based societies. To flesh this out a bit, results from a Pew Foundation survey back in 2012 showed how Americans categorized themselves. 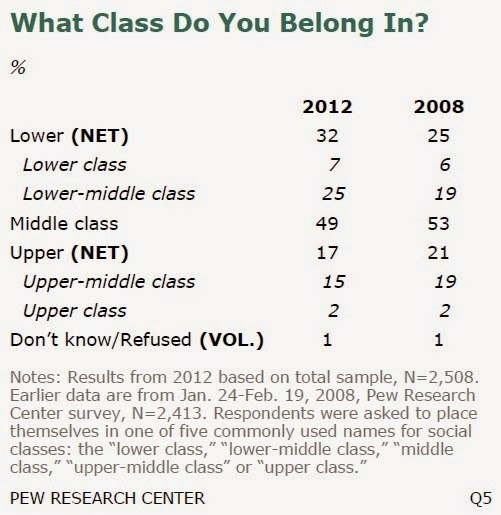 Notice that only 7% of Americans identify themselves as "lower class" and only 2% as "upper class." Apparently, the "middle class" includes 91% of the U.S. population. How does this differ for lower-income countries? In its Global Employment Report 2013, the ILO categorizes the population of low-income countries by the fairly standard measures of "extremely poor," which consumption of less than $1.25 per person per day; "moderately poor," from $1.25 to $2 per day; near-poor, from $2 to $4 per day; "middle class," between $4 and $13 per day; and "above middle class," which is above $13 per day in consumption. By this standard, the "middle class" in the developing world is on the rise, but is not yet more than half the population. As the total share of poor and near poor workers gradually fell, an estimated 41.6 per cent of the developing world’s workers were attaining the middle and upper-middle-classes in 2011. This is a remarkable development given that in 2001, less than 23 per cent of the developing world’s workforce was middle-class versus 53.7 per cent living in poverty. 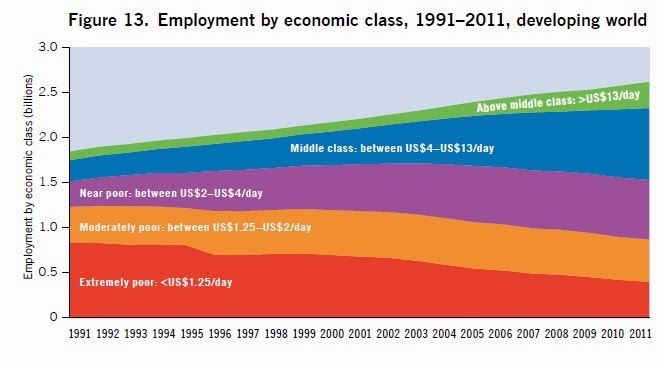 The decade from 2001 to 2011 saw rapid growth in middle-class employment, with an increase of nearly 401 million middle-class workers (above US$4 and below US$13) and an additional increase of 186 million workers above the US$13 a day line. Current ILO projections indicate that the number of workers in the middle-class and above in the developing world could grow by an additional 390 million by 2017, with the share of middle-class workers rising to 51.9 per cent. It may be a fool's mission to try to generate a shared idea of "middle class" that reaches across the experience of the U.S., other high-income countries, and also low-income countries around the world. The growth of income inequality in the U.S. and other high-income countries may be eroding the shared sense of "we're almost all middle class," at the the same time that growth in emerging economies is moving toward a situation where a majority fall within at least some definition of teh middle class. But in a rough-and-ready way, I think the key factor in defining the middle class may be a sense of whether your life typically involves living from week-to-week or month-to-month relying on a regular paycheck. For example, I think that the reason many objectively low-income people in the U.S. view themselves as "middle class" is that they are working for livilng. Similarly, high-income people in the U.S. view themselves as "middle class" because they have bought into a world of high expenses, and thus they also feel an ongoing pressure that they are working to pay their regular expenses. In low-income countries, the key step that often moves people up to the "middle class" is a regular job with a paycheck, as opposed to holding a series of ad hoc, temporary, and subsistence jobs. Freire makes the interesting suggestion that the "middle class" shares a consumerist mindset, which offers both a kind of shared social identity, support for a set of political institutions, and a functional basis for ongoing economic growth. In low-income economies, building support for institutions, laws, and infrastructure that allow the middle class to grow and flourish may be a delicate political business when the middle class is a minority. But as the middle class moves toward becoming a majority, I wonder if building building support for these institutions, laws, and infrastructure may become easier. Obviously, the middle class in lower-income developing countries will not equal the buying power of the middle class in high-income countries any time soon. But that said, the new middle class in low-income countries will in many ways have much more in common with the middle class around the world than did the "absolutely poor" living on less than $1.25 per day. A certain kind of shared globa consumerism--bolstered by cheap computing power, cellphones, brand names, news, movies music, and the Internet--may be on its way. Full disclosure: I was an outside reader of the ILO Global Wage Report 2014-15 last summer, and received a modest honorarium for commenting on a draft of the report.